BETHESDA, MD--(Marketwired - Dec 15, 2016) - Deborah Klotz, DDS and Robert Schlossberg, DDS were two of the first cosmetic dentists in Bethesda to employ sedation techniques to help alleviate anxiety and expedite treatment for patients seeking dental care. As such, they wanted to incorporate the theme of sedation dentistry throughout their website, highlighting the fact that great care is taken to ensure patients are entirely comfortable and relaxed during their visit. 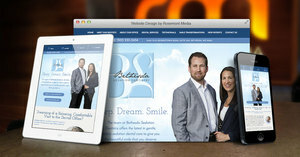 Enlisting the help of dental marketing firm Rosemont Media, Drs. Schlossberg and Klotz were able to make this dream a reality by completely renovating their site with an all-new look and enhanced user experience. Ultimately, Drs. Klotz and Schlossberg are pleased with how well their website mirrors the atmosphere and sophistication of their practice, and they hope anyone interested in dental care in the Washington, DC area will view it as a trusted and valuable resource for learning about their treatment options. Led by Dr. Schlossberg and Dr. Klotz, Bethesda Sedation Dentistry is a state-of-the-art practice committed to providing an exceptional quality of dental care in a relaxing, pleasant environment. In addition to routine cleanings and general/preventative treatments, the practice offers numerous cosmetic and restorative options such as porcelain veneers, teeth whitening, dental implants, and full mouth reconstruction. Regardless of the procedure, sedation techniques like nitrous oxide, oral conscious sedation, or IV sedation are always available to help ensure the utmost comfort and efficiency. For more information about Bethesda Sedation Dentistry, visit bethesdasedationdentistry.com.